Posted Jan. 27, 2018, 8:43 a.m.
Posted Jan. 21, 2018, 3:02 p.m.
Richard Gardner III, a 52-year-old white man, was pronounced dead on Saturday, Jan. 13, after suffering “trauma to the body” in the 1100 block of West Avenue N12 in Palmdale, according to Los Angeles County Sheriff’s Department homicide investigators. Deputies went to Gardner’s modest Palmdale home around 2:25 p.m. after his sister asked authorities to check on her family, said Lt. John Corina. The sister was worried, he said, because she hadn’t been able to reach anyone at the house where her disabled brother lived with their father, Richard Gardner II, 78, and their father’s wife, Pepper Gardner, 56. When deputies arrived they found the elder Gardner dead in the small, single-level house, Corina said. A short while later, investigators found Pepper Gardner and the younger Gardner dead in another part of the house. All three suffered “trauma to their bodies” that did not involve gunfire, Corina said, but he wouldn’t provide more details about the cause of death or where their bodies were found in the house. Investigators have put a security hold on the autopsy results until the investigation is completed, meaning the cause of death can’t be made public. Corina said investigators believe the victims were all killed within a day of when they were found, but they are still trying to piece together what happened, and when. 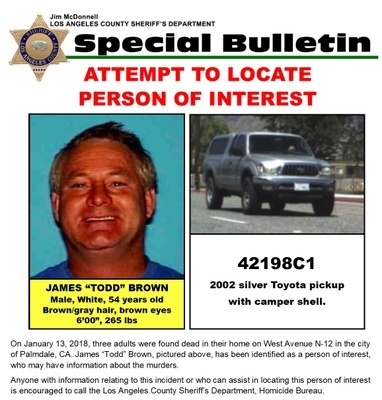 Four days after the bodies were found, investigators identified a “person of interest” in the case, James “Todd” Brown, a 54-year-old white male who lived in a trailer on the Gardner’s five-acre property and has been missing since the bodies were found. Anyone with information is asked to call Det. Gail Durham or Sgt. Eric Arias at the sheriff's Homicide Bureau at (323) 890-5500. Those wishing to remain anonymous should call Crime Stoppers at (800) 222-8477. Photo above: Investigators have identified James"Todd" Brown as a person of interest in the triple homicide that killed Richard Gardner II, his wife and his adult son. Brown was a tenant on the Gardner's property, authorities say. Credit: Los Angeles County Sheriff's Homicide Bureau.